Selecting an ATS FXP™ duct system provides many direct and indirect cost savings over the short and long term. No need for costly sprinklers, drains or gray wastewater holding tanks. Accurate field-assembled components save labor and installation time. Innovative joining systems save time and money on future maintenance and system modifications. ATS FXP™ duct offers superb durability for long service life – a properly maintained ATS FXP™ duct system can provide 30+ years of satisfactory service. 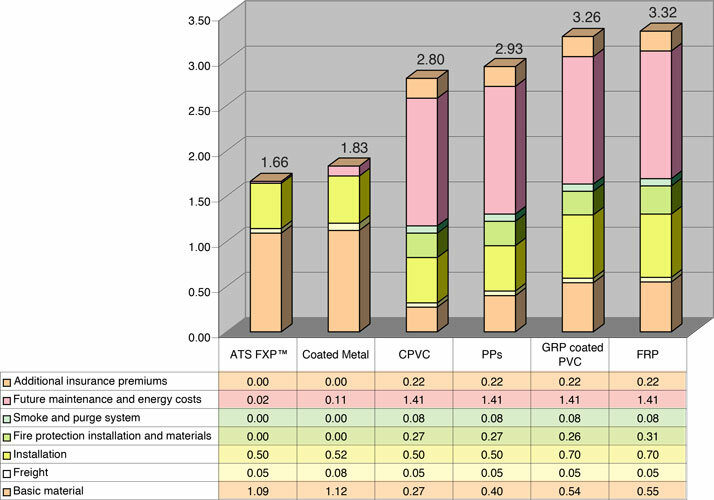 ATS FXP™ duct has lower pressure losses than standard duct saving energy costs.